Watch the following video where 6 members of the 1977-1978 World Series Champion New York Yankees sat down with Steiner Sports CEO Brandon Steiner on December 9th, 2013,for an exclusive interview at Cipriani on Wall Street. Bucky Dent earned two World Series rings as the starting shortstop for the New York Yankees in 1977 and 1978, and was voted the World Series MVP in 1978. After retiring as a player, Dent managed in the Yankees’ minor-league system, notably with the Columbus Clippers. He served the Yankees as manager of the big-league club for portions of two seasons, compiling an 18-22 record in 1989 and an 18–31 record in 1990. Playing Field Promotions is a booking agent for motivational sports speakers and celebrities. 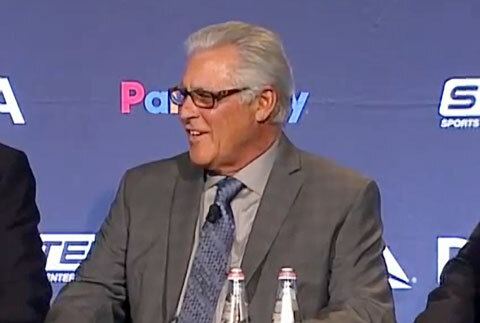 If you would like to book Bucky Dent for a speaking engagement or personal appearance, contact Bucky Dent’s booking agent for appearance & speaker fees at 1.800.966.1380.